The first thing about the book is that the title is misleading. The recipes are actually vegan, not just dairy-free, and most of them are full to the brim with sugar (not white sugar, but sugar none-the-less). Her main focuses are vegan ingredients, natural ingredients, and low fat. What makes the book interesting is the discussions of how to substitute ingredients (mostly alternatives to traditional sweeteners, dairy, and eggs, plus reducing fat and using whole foods when possible) along with the ample trial and error from the author’s kitchen. Some books may suggest you can use X instead of Y, but McCarty tests it and tells you how to change the recipe to accommodate Y and also if Y doesn’t work. Many of the recipes are gluten-free by virtue of what they are (sorbet, for example) but most do contain wheat. McCarty discusses wheat alternatives and gluten-free flours but the testing isn’t as extensive. There is a gluten-free cake recipe and gluten-free cookies, plus tips for pie crust. Many books dedicated to gluten-free will use eggs (and often dairy) so this is a good complement to those if you need to avoid both. 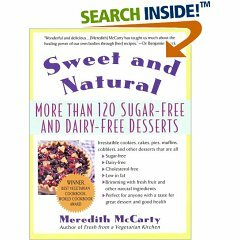 Although the recipes look good (I haven’t tested them and I don’t know if her tips are accurate, but I have no reason to doubt them), McCarty’s nutritional advice can be a bit off. She spouts old scientists’ tales that have been disproven (like the myth that dietary fat causes breast cancer) and she’s one of those vegans who feels it isn’t enough to simply not eat animal products. I’m vegetarian for ethical reasons (both for the welfare of the animals but also for the environment, resource allocation, etc) and that’s enough. There are health considerations, but I’ve never felt the need to turn animal products into some health-destroying conspiracy. Some of her “facts” are on the ball and others are overkill. The recipes are fairly clear, with ingredients explained (though you often have to go to other sections for that). If one recipe depends on another, there is a page number reference. Each recipe has a sidebar with basic nutritional information.